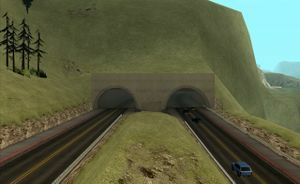 Bayside Tunnel is a road tunnel servicing the highway running from Gant Bridge, through Tierra Robada, and into Bone County. 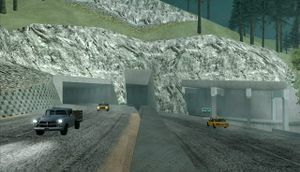 It sits just to the northeast of the city of Bayside, cutting into the nearby hillside. Vortex (rolls down the sand into the water when the player see's it). This page was last modified on 23 February 2012, at 22:39.